Some food aficionados swear that foie gras — engorged duck liver — is delicious. But when you find out the cruel way it's made, you might think twice. Farm workers often force-feed ducks up to 30 lbs of grain and fat down down their gullets a week, far more than a duck would ever consume. Eating so much food causes their livers to painfully grow up to 10 times their normal size. For some birds, their livers become so big they can't even stand. The delicacy and its production have been banned in several countries, and some governments — including India and California — have prohibited the sale of it altogether. Unfortunately, New York is not one of them. The Empire state is home of Hudson Valley Foie Gras, the nation's largest foie gras farm in the U.S. While the company claims best practices and animal welfare concern, the very practice of producing foie gras is inhumane and should not be allowed by any government. 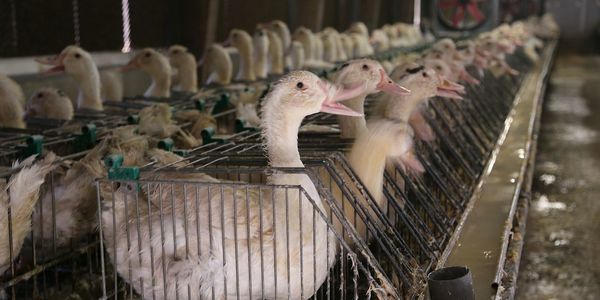 New York needs to take a stand against animal factory farm cruelty and follow in the footsteps of California by banning foie gras in their state. Sign the petition and ask NY to do the right thing and end this horrible practice within their borders.